For over 30 years, European Judaism has provided a voice for the postwar Jewish world in Europe. It has reflected the different realities of each country and helped to rebuild Jewish consciousness after the Holocaust. 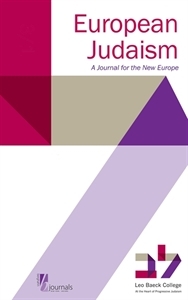 The journal offers: stimulating debates exploring the responses of Judaism to contemporary political, social, and philosophical challenges; articles reflecting the full range of contemporary Jewish life in Europe, and including documentation of the latest developments in Jewish-Muslim dialogue; new insights derived from science, psychotherapy, and theology as they impact upon Jewish life and thought; literary exchange as a unique exploration of ideas from leading Jewish writers, poets, scholars, and intellectuals with a variety of documentation, poetry, and book reviews section; and book reviews covering a wide range of international publications. Please note that this journal is available in online-only format - click here for details.